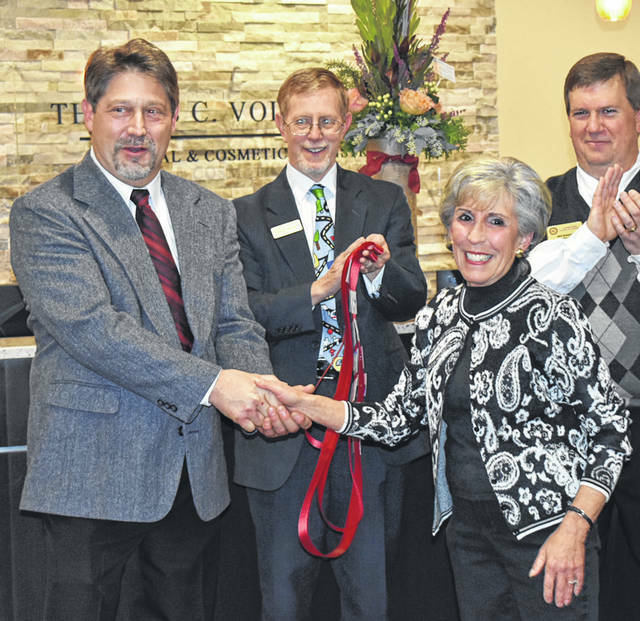 Vandalia Mayor Arlene Setzer congragulates Dr. Thomas Volck on the dental practice’s new location. Dr. Volck and staff are joined by members of the Vandalia-Butler Chamber of Commerce as they cut the ribbon on new offices on Natioal Road. 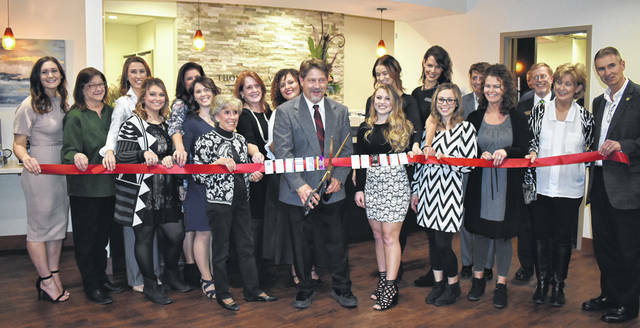 VANDALIA — Vandalia’s long-time dentist, Dr. Thomas C. Volck, and his staff celebrated the grand opening of their new office on Thursday evening. Volck’s dental practice is now located at 205 W. National Road which sits on the former site of the old Morton Middle School building. The expansion has led to the creation of six additional jobs at the practice. Volck said the new facility has state of the art technology and equipment designed to make patient visits quick, safe painless, and relaxing as possible. Volck’s practice is participating in Operation Christmas Child which is operated through Samaritan’s Purse. Community members are invited to drop off shoe boxes, small toys, accessories, children’s clothing items, hard plastic water bottles, and personal care items. “As a Christian office, we are honored to be part of such a great cause,” said Marketing Manager Lauren Janowiecki. She said the practice will partner with Christian Life Center, Two Rivers Community Church, Living Word, and other churches in Vandalia to participate in local community outreaches and ministries. Updates on those efforts can be found on social media and the practice’s website.